Fondant Potatoes with Porcini Mushrooms and Caciotta with Cervia Salt. - Wash well the potatoes and cook them starting with salty cold wateruntill they will be tender in their centre. 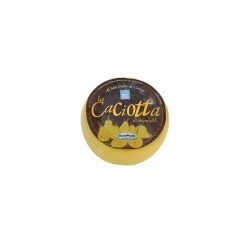 - Meanwhile chop the caciotta. Clean very carefully the mushrooms with a damp paper towel, cut into little cubes and mix with the caciotta. 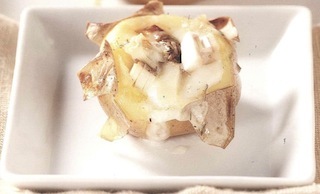 - Remove the upper part of the potatoes and dug a little in the centre with the add of a spoon. Stuff them with the mixture of mushrooms and caciotta previously obtained and season with thyme and olive oil.